A 26-year-old man is facing criminal charges after allegedly forcing a 5-year-old girl to smoke marijuana, KOIN reports. Marquise Rashad Harris-Hill was arraigned on Monday for first-degree criminal mistreatment, third-degree assault, unlawful application of a controlled substance to another person, "unlawfully causing another individual to ingest a controlled substance and unlawful delivery of marijuana to a minor," the news site notes. The incident, which took place earlier in May, came to light because an anonymous source tipped off investigators, saying that they heard a child being beaten. When officers went to the apartment to check it out, they found the little girl in her underwear, standing in a corner crying, with her head shaved, the news site reports. According to police, and as reported by the news site, the child had "visible bruises all around her torso." Authorities are holding a "studded" belt as evidence after "welts" were found on the little girl's arm. The child told officers that she had been beaten with the belt because she did not brush her teeth. 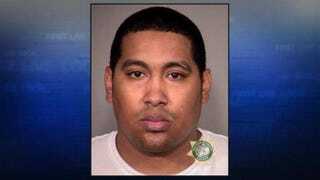 Harris claimed that he beat the child at the "direction of the mother," KOIN reports. The mother had not been charged as of Monday. The little girl also said that Harris made her smoke pot.